SIGNED ROLEX, OYSTER PERPETUAL, COMEX, SUBMARINER, 660FT=200M, REF:5513, NO. 2833584, CIRCA 1968. Calibre 1530, rhodium finished 36-jewel self-winding movement, black dial with luminous markers and Mercedes hands, the dial signed COMEX, circular case with gas escape valve in the band at 9 o'clock, rotating calibrated bezel, crown guards, trip-lock crown, screw down back engraved Rolex, Comex, stainless steel Oyster bracelet with flip-lock, movement, dial and case signed. 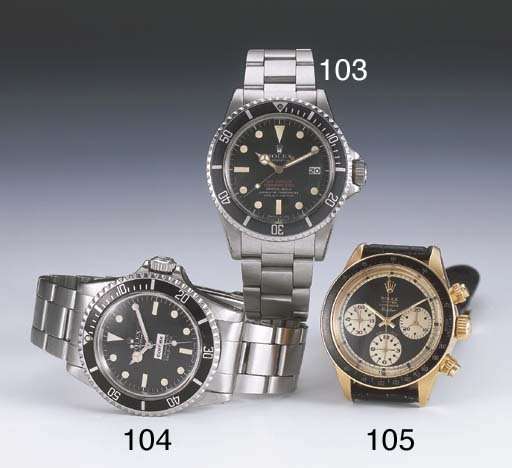 For an example of this reference, see James M. Dowling & Jeffrey P. Hess, The Best of Time Rolex wristwatches, An Unauthorized History, Schiffer Publishing Ltd. 1996 edition, p. 268. The first prototypes of the Sea-Dweller were in fact Ref:5513 Submariners fitted with a gas escape valve, these watches were developed in conjunction with the French diving company Comex. This lot is one of the early models fitted with a standard plastic crystal.